The Salty Balty Blog: The Big Chicken. I spent the day in Marietta, Georgia for work and stumbled upon one of the more amazing Americana sites I believe exists in our fair country - the big chicken. After an unbelievable lunch at Williamson Brothers BBQ (I think we sampled everything on the menu and while I'm a devoted Andy Nelson's fan... This was it. Just it. ), the guys I was in to meet with asked a simple question - "Have you ever seen the Big Chicken?" Um, no. Can't say that I have! 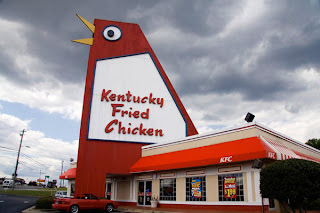 Apparently in Marietta (just outside Atlanta), people use the Big Chicken as a landmark around which directions are given, meetings are taken, and of course - chicken is eaten. It is exactly what it sounds like. It is a giant chicken building and it clucks - not unlike how our Boh Man winks to our Charm City every evening. So, dear readers, I humbly submit two items for your bucket lists... 1) Make sure you've flirted with Mr. Boh in Brewers Hill atop a rooftop deck and 2) visit the Big Chicken.